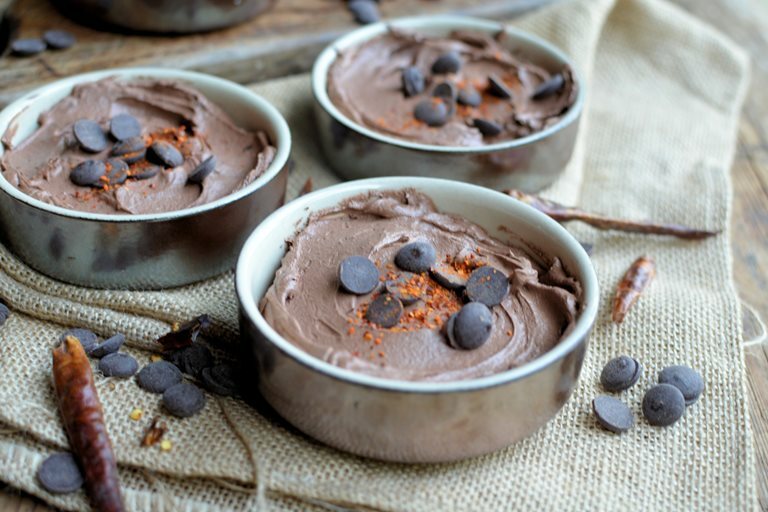 A rich chocolate mousse is given a Mexican twist, thanks to the addition of chilli powder in this glorious recipe from Karen Burns-Booth. With Chocolate Week in full swing now and with friends coming over for a special meal tonight – to celebrate the start of autumn, which is really an excuse to indulge in some comfort food, I decided to treat them to a kicked up version of my usual chocolate mousse recipe. 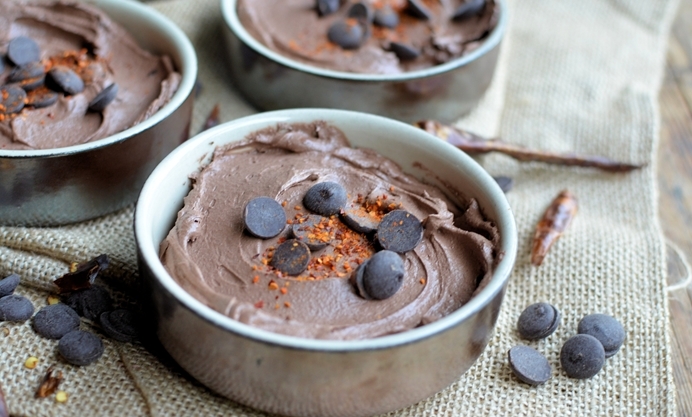 This cold weather version for Mexican Chocolate Mousse has a very cheeky ingredient added, some chilli powder, in order to perk up everyone’s taste buds and give them a warm glow in their tummies! It’s a very simple egg enriched chocolate mousse recipe, similar to my recipe for Irish Cream Chocolate Mousse on Great British Chefs, but with chilli and bitter dark chocolate, and, it also happens to be lower in calories than some other chocolate desserts, with each portion coming in at only 200 calories – so, as well tasting decadent, it’s also kind on your waistbands too, although don’t forget to add the calories on if you add cream. Serve these in shallow dishes and don’t worry if they aren’t perfectly smooth on top – I think that adds to their rustic charm – and, if you want to serve these deliciously dark chocolate treats to non-chilli lovers, then by all means omit the chilli powder. These are one of those dessert ideas that I like to think are strictly for the “grown-ups”, so make sure the children don’t see them before you serve them! Mexican cuisine is famous for its use of chocolate and chilli in sweet and savoury dishes, and one of my favourite hot drinks is for Mexican Hot Chocolate – the liquid cousin to my mousse recipe today and a veritable frenzy and fest of chocolate and cocoa…..all blended in a mug of hot milk for the perfect afternoon pick-me-up, or more like an afternoon boot up the derrière! I hope you all enjoy this simple recipe for my chilli infused chocolate mousse, and don’t forget this recipe is just for the adults!